For some reason unbeknownst to us mere mortals, Apple chose not to include iPad versions of several of its iPhone apps on the device, namely Calculator, Clock, Stocks, and Weather. 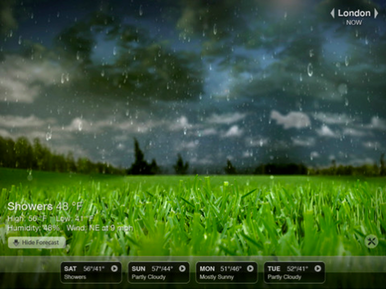 But third-party developers are already rushing to fill the void, with one of the first contenders being Weather HD from Vimov. Weather HD goes all-out on the eye candy and includes gorgeous high definition videos of various weather conditions, displaying the appropriate one according to the current weather. Sure, you could just look outside, by why do that when you can see your weather in HD. The app also has support for multiple cities and can show the current weather conditions, the highs and lows for the day, level of humidity, and the wind speed and direction. Weather HD is now available on the App Store for $1 and is compatible with any iPad running iPhone OS 3.2 or later.